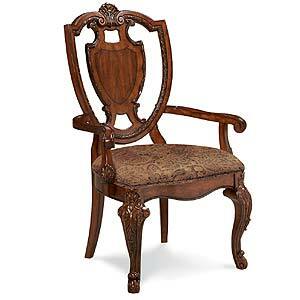 High back wing chair brings drama to the dining room. 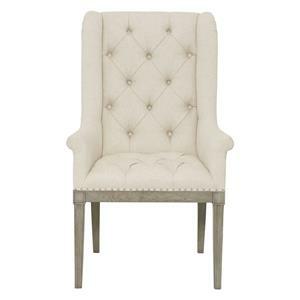 Comfortable, fully upholstered seat and back with nailhead trim. Significant beadwork follows the circumference of the design. The Morrissey Dessner Host Chair by A.R.T. Furniture Inc at Thornton Furniture in the Bowling Green, Alvaton, Glasgow, Scottsville, Franklin area. Product availability may vary. Contact us for the most current availability on this product. Finish & Paint Options Thistle finish: A lower sheen, open grained coffee bean stain with cool undertones. The darkest finish has an organic nature that can be both casual and dramatic. Smoke finish: As the name implies, this neutral gray color has delicate warmth in its initial base steps. This brings approachability to the stain that allows for maximum use as a primary finish. Bezel finish: A striking silver paint finish that has been gently aged with warm glazing and texture. This glamorous tone is found on most accent pieces and ignites the style quotient of foundation pieces. Browse other items in the Morrissey collection from Thornton Furniture in the Bowling Green, Alvaton, Glasgow, Scottsville, Franklin area.